DAD acts as a focal point for consultation with disabled people and carers. It also manages a range of services / projects to support its aims. The NHS Long Term Plan was published in January 2019 and includes a commitment to expand personal health budgets - including personal wheelchair budgets - so that 200,000 people can benefit by 2023/24. It is important for people to be able to share their experiences of having a personal health budget, integrated personal budget or personal wheelchair budget. NHS England remain committed to understanding and improving people’s experiences and have launched the Quality Health PHB survey to gather your views. The survey is open to all current or previous budget holders and those who support them, including those who responded last year, and, for the first time, will separate out wheelchair budgets from other types of PHB. The survey closes on 14 May. DAD supports the work of Darlington’s People’s Parliament, a self-advocacy group for people with learning impairments and / or Autism. In 2017 a partnership was formed between DAD and Darlington Building Society to support self-advocacy and the work of Darlington’s People’s Parliament. This short video from People’s Parliament thanks Darlington Building Society for their support and explains a bit more about the work of Darlington’s People’s Parliament. For more information about People’s Parliament please contact Jenny Byers on 01325 489999. Everyone enjoyed a very lively discussion on Tuesday 26th March at The Hub as a group took part in the Health and Social care survey from Healthwatch Darlington. Please visit the personal experiences page for more information about activities at The Hub. Young People from DAD enjoyed a visit to Darlington Town Hall last week after being invited to visit by Darlington Mayor, Councillor Veronica Copeland. The Mayor gave a tour of the Mayor’s Parlour and talked to young people about the role of the Mayor and local disability history with the opportunity for young people to ask the Mayor questions. They all really enjoyed the evening and thank the Mayor for inviting them. In April 2014 the government published ‘Think Autism’, a strategy for meeting the needs of adults in England with Autism. The strategy supports the Autism Act 2009. Today, the Department of Health and Social Care, with the Department for Education, has launched a national call for evidence to inform a review of the Autism Strategy and is inviting views from people with Autism (adults, children and young people), their families and carers as well as those of professionals. It is aimed at finding out what is working, where progress has been made and where more needs to be done in the future. The call for evidence can be accessed online at this link and is open for responses until 16 May 2019. Our new telephone system is now in place for anyone who needs to contact our offices in Darlington. Our new system gives you the option to choose one of our main projects directly, by pressing the number given on the message, or you can press option 5 or hold and you will be put through to reception. Please let us know if you experience any difficulties getting through. Our Middlesbrough telephone has not changed and you can contact that office on 01642 049920. The Mayor is holding a quiz night, where all proceeds will go to her Fund and this year DAD is one of The Mayor's chosen charities along with the 700 Club and The Royal British Legion. Date: Friday 22nd March 2019. Time: 7.00pm arrival, 7.30pm start. Venue: Blackwell Meadows Rugby Club, Grange Road, DL1 5NR. Cost: £10.00 per person, which includes entry and a Pie and Pea Supper. There will be a bar available. If you would like to support the event please contact DAD for tickets or to donate a raffle prize. DAD is delighted to announce that we have been chosen by the Department for Education's local office in Darlington, as one of the charities they will be supporting this year through their fundraising efforts. 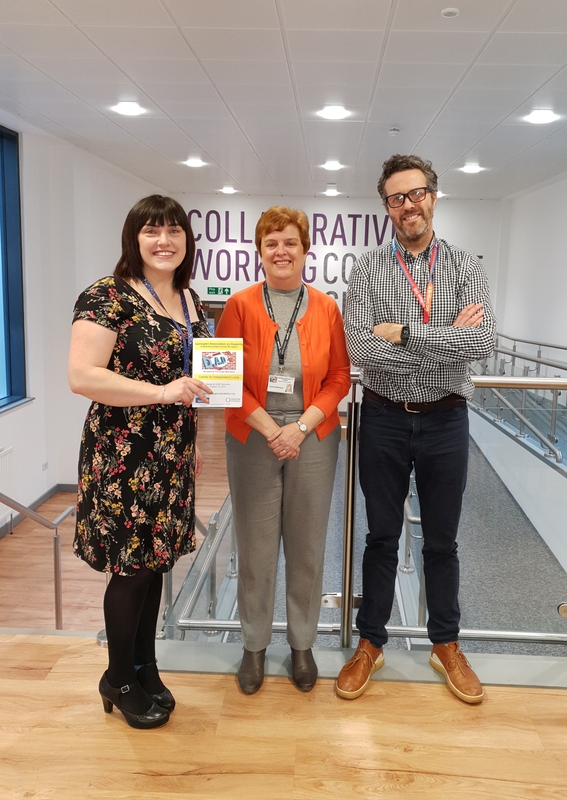 Pictured above is Lauren Robinson, our Chief Executive, with Phil North and Amy Bush from DfE when they met to hear about DAD’s work. Staff at DfE will be supporting many fundraising activities throughout the year including bake sales and undertaking the Darlington 10k race! DAD is supporting the Alliance for Inclusive Education (ALLFIE’s) project examining the effectiveness of secondary school Accessibility Plans in England. As a Disabled-led organisation, we are committed to removing barriers in education, and we hope this project will make a meaningful contribution to the inclusion of Disabled children and young people in mainstream schools. If it is appropriate to you, your education, your work or your family, it would be great if you could please take the time to fill in these questionnaires. As parents and professionals, your voices and experiences are central to this project. Your input will be very valuable in working towards the creation of accessible, inclusive schools where all children are enabled and supported to learn and participate equally. Please follow the link relevant to you: Parents’ questionnaire or Educators and professionals’ questionnaire. We would also be most grateful to you if you would please share these links with your contacts and networks. The more responses that we can get, the more representative our project can be of the diversity of people’s school experiences. Congratulations to Lauren, one of DAD's Young Leaders, who has recently successfully applied to become a member of the Young National Children's Bureau (NCB) Advisory Group. The Young NCB Advisory Group is a group of 20 children and young people from across England who come together to advise NCB on strategic direction and project development. The group, who are aged 11-24, meet 4 times a year to discuss a range of issues facing children and young people today such as mental health, child poverty and education. NCB make sure that children and young people’s views and experiences inform every aspect of their work in order to bring about lasting change for them, others, their services and their communities. Stop Speak Support Day focussing on cyberbullying. Lauren, one of DAD's Young Leaders, has been working with other young people from the Anti-Bullying Alliance, NSPCC and The Diana Award to write and produce this video which is being used to launch the Stop Speak Support campaign. As part of her involement in this work Lauren attended the Anti-Bullying Week Parliamentary Event at Portcullis House in Westminster and attended the Stop Speak Support campaign launch. DAD Trustees have decided to support this very important appeal by Cheshire Centre for Independent Living as the outcome could affect the future of many Disabled People's organisations and individuals who are employers and need a payroll support service to assist them. Please visit this link for more information. Unfortunately DAD will no longer be providing Independent Support to families and young people, further details can be found here. An important part of DAD’s work is our partnership with local people, which supports our aim to improve the lives of disabled people, children and carers locally. From time to time we contact people to give updates on our work and other local and national issues which impact on the lives of disabled people. For us to continue to keep in touch with you after the 25th May 2018, we need your permission to contact you in the future. If you have not received a consent form to complete, you can email us or complete the online consent form and give us permission to continue to contact you and keep you updated. Please visit the Privacy Statement page to see how we handle personal data and how we meet the new legislation called the General Data Protection Regulation (GDPR). DAD are delighted to announce that they have been chosen as one of the Mayor's Charities for the coming year. Gordon Pybus, Chairman and Lauren Robinson, Chief Executive are pictured with the new Mayor Councillor Veronica Copeland, a long standing DAD member, at her inauguration ceremony on 17th May 2018 at the Town Hall. 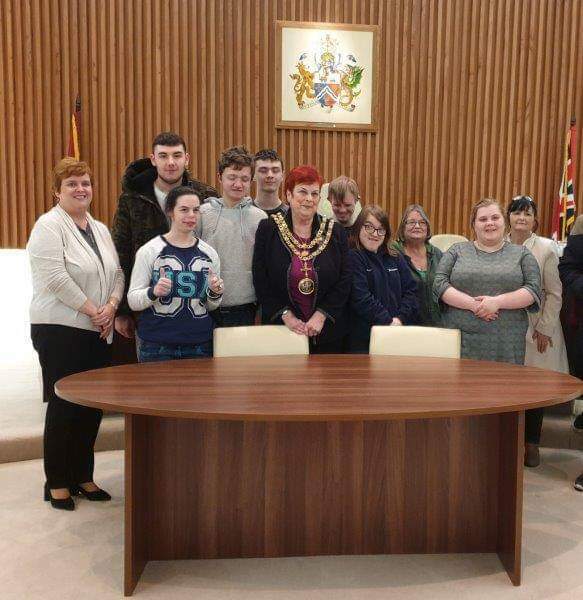 In her acceptance speech in the Council Chamber, the Mayor spoke about the barriers she had faced as a young disabled person to gaining qualifications and the ‘medical model’ attitudes she had encountered about her ambition to be an Occupational Therapist. The Mayor achieved her ambition and had a very varied career in Darlington working for both the Council and The NHS. 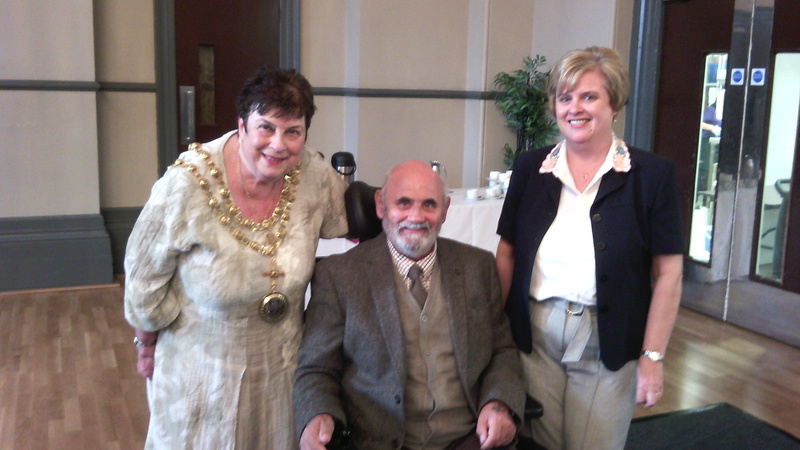 The Mayor was instrumental in introducing the requirements of the Chronically Sick and Disabled persons act in Darlington and even introduced her own access awards in the 1970’s! The Mayor has served in public office as a local Councillor for 20 years and is very much looking forward to her Mayoral year. Please visit the Disability Equality Training page to read Alisha's blog. Alisha is one of DAD's Young Leaders and she wrote this blog as part of her work with FLARE. DAD thinks this blog is so important that we are incorporating it into DAD’s Disability Awareness training. DAD supports and encourages co-production and children and young people’s participation as a result of which a new section called Participation and Co-Production has been added to the website. 'Safe places' are open to anyone (adults or children) who feel threatened, intimidated or anxious and provide a point of contact and offer a range of help - from a chance to talk to someone over a cup of tea, to help with reporting an incident to the police. All Safe places in Darlington will display the logo below. Follow this link for a full list of 'Safe Places' in Darlington. A NEW and unique service to support victims of hate crime has launched at an event on July 25th 2017. The Hate Crime Advocacy Service (HCAS) works directly with victims and witnesses of hate crimes and incidents to help them through the process of prosecution. It can also help them to cope with the crime to which they have been subjected. Darlington Association on Disability, QuerKey CIC, and Show Racism the Red Card have partnered with Ron Hogg, Police, Crime & Victims’ Commissioner for County Durham and Darlington to create this unique advocacy service. By being a buffer between the victims and the various agencies from the Police to the Crown Prosecution Service or the courts, the advocates can enable better experience and outcomes from the criminal justice process. Laws are in place to protect victims of targeted behaviours relating to race, faith, disability, sexual orientation and gender identity. HCAS draws on the expertise of three organisations which offer support for victims of all strands of Hate Crime. Each agency has expertise in their sector and together they will provide a unique service for victims of crime. Victims of all types of hate crime can benefit from using the service. Emma Roebuck, Director QuerKey CIC said: "The voice of the victim is seldom heard in the prosecutions of crime. This leaves the victim adrift and without the opportunity to move beyond the crime and back into normal life. This project will give that voice from the point of reporting to beyond the court room." Olivier Bernard, ex Newcastle player and owner/manager of Durham City Football Club, has worked with Show Racism the Red Card for many years. He said: “I first arrived in the North East in 2000 and was welcomed with open arms. The region is now my home and I love being treated as ‘North Easterner’. Since becoming owner of Durham City FC, the people of Durham have been incredibly welcoming too. Victims or witnesses of a hate crime can obtain free, confidential support by email at: hcasdurham2017@gmail.com or call 01325 267359. For advice on how to report Hate Crime, please visit the Hate Crime section where advice for reporting is at the top of the page as well as more information. The Disabled Children’s Partnership is a coalition of more than 45 charities that joined forces earlier this year to campaign for improved health and social care for disabled children, young people and their families. Darlington Learning Impairment Network have produced their third open letter about the language we use and how this can impact on people’s life. People’s Parliament with DAD’s support have been involved with this and is worth a read as it is an important reminder that we reflect and think carefully about the language and words we use. Being disabled in Britain is a review into disability inequality in Great Britain. It builds on the Equality and Human Rights Commission’s statutory five-yearly report on equality and human rights progress in England, Scotland and Wales. DAD is always grateful for any support given in these very difficult times. Work is underway to re-focus efforts to attract any help, support or finance into DAD and our support page has had a re-write with further developments to come as well as being moved higher up the website index bar. Please take a moment to read the page and contact us if you have any suggestions. Thank you. DAD is looking for new Company Members. Can you support us by becoming a Company Member of DAD? Darlington Association on Disability (DAD) is a charity limited by guarantee this means it is a charity and a company. DAD runs projects and schemes that have members like Shopmobility, Carers, Young Leaders, Stakeholders and the Independent Living Hub for example. We are pleased to have so many members of groups and projects getting actively involved but it has led to some confusion over the membership of DAD itself. The confusion comes from the misunderstanding around DAD Membership. Many people who are members of these groups, projects and schemes believe they are members of DAD, but unfortunately they are not. To be a DAD company member you must be a member of the company and DAD would like as many people as possible to be a DAD company member whether they are already members of a group, project or scheme within the organisation or not. Volunteers, service users or anyone who is interested in disability or carer issues are welcome. Company membership is free; however, anyone wishing to be a member must agree to the company Memorandum of Articles agree to abide by them. The Memorandum of Articles can be translated or read out and explained if that is what someone prefers. DAD company members and only DAD company members can vote at the AGM or any General Meeting. Only DAD company members can become Trustees of DAD and only DAD company members can make changes to DAD’s Governance. DAD aims to ensure that disabled people and carers have control over their own lives and by becoming a DAD company member you will be helping us to continue our essential work. Please apply now to be a DAD company member. If you think you are already, please still get in contact with us so we can check. • A minimum eligibility threshold across the country - a set of criteria that makes it clear when local authorities will have to provide support to people. • A local authority duty to consider the physical, mental and emotional wellbeing of the individual needing care. They will also have a new duty to provide preventative services to maintain people’s health. • The care system to be built around each person - through Personal Budgets. • Carers to be entitled to an assessment in their own right. Factsheets have been produced to accompany Part 1 of the Act and will come into force on 1st April 2015 (unless otherwise noted). DAD Stakeholder Forum - register your interest now! • put forward proposals on how we could do even more for disabled people and carers. DAD projects, particularly new ones or ones that have changed over time use the Forum to explain what they do and how, as well as encourage members of the Forum to voice their opinions. All proposed new projects can use the Forum as a valuable sounding board. Any Forum member is able to put relevant items on the agenda within a set timescale. We propose to hold a Stakeholder Forum two or three times a year, taking up a full morning or afternoon. We propose to vary meeting dates to include school holiday periods so young people can attend as well as term time to accommodate those with childcare needs. If you are a DAD service user, DAD volunteer, DAD member or representative of a DAD project and you wish to be a member of DAD’s Stakeholder Forum please contact our Chair, Gordon Pybus, to register your interest. Email Gordon Pybus or phone 01325 489 999. DAD welcomes the opportunity for consultation, and will endeavour at all times to provide information and advice which, if followed, would result in the best possible outcome for disabled people. DAD recognises that consultation often forms one part of a larger decision making process, and that outcomes may not always reflect the balance of views that DAD has provided or the outcomes that it has advised. Organisations must not expect DAD to endorse decisions made, following a process of consultation or advice-giving, where the final outcome does not reflect the views of, or advice provided by, DAD or gives the impression in any way that DAD does endorse said decisions. Hate Incidents and Crimes are generally reported straight to the police, however, if people would prefer not to, or need support they can now report any hate incident/crime against a disabled person through Darlington Association on Disability (DAD) during office hours, 9:30 - 5, Mon - Fri.
A hate incident is any incident which may or may not constitute a criminal offence, which is perceived to be motivated by prejudice or hate against disabled people. A hate crime is a hate incident which does constitute a criminal offence, and again is motivated by prejudice or hate against disabled people. The victim, a witness or any other person who knows or believes a hate crime/incident has taken place can make a report. So why report it? The third party reporting system allows you to report a hate incident/crime to the police through DAD by giving us as little or as much information as you wish. All reports are kept confidential. By reporting it, it will enable the police to act upon such incidents and also build up patterns of behaviour and areas within the community where hate incidents and crimes are being committed, enabling them to allocate resources more effectively. Safety and security, and the right to live free from fear and harassment, are fundamental human rights. Our trustees and staff are working hard to save DAD’s services and we would appreciate any support you are able to give. One way to acknowledge the difference DAD has made to your life would be to make a regular monthly donation to DAD. Visit our page on the justgiving website JustGiving to make a secure online donation. The page also allows you to follow our fundraising activities and sponsor an activity. You can also make a donation by calling in to any of DAD's offices. A regular donation to DAD would enable us to continue with our work, supporting disabled people and carers. If you would like to make a regular donation by Direct Debit please contact our Business Support Officer, Judith, at Enterprise House.